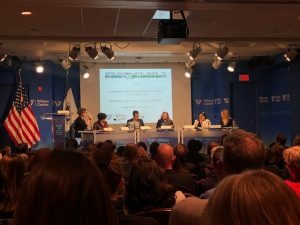 Prospects of the “Green New Deal” passing Congress comes down to voter intensity and the level of new regulations imposed, according to leading environmental reporters at a forum organized by the Society of Environmental Journalists (SEJ) and hosted at the Wilson Center in Washington, D.C.
Eilperin explained that while there has been and uptick of discussion among House Democrats, voters do not appear to be following yet, given the opportunity to support clearly defined policies like carbon taxes. She spoke at SEJ’s 2019 Journalists’ Guide to Energy and Environment, which also featured reporters from The New York Times, Politico, Associated Press, E&E News, and The Guardian. Politico’s Pradnya “PJ” Joshi Pradnya joined Eilperin in saying that the “Green New Deal” being championed by U.S. Rep. Alexandria Ocasio-Cortez (D-N.Y.) could gain traction if constituencies like farmers increase awareness and it does not involve too many additional regulations. Eilperin pointed out the issue can increase voter intensity and voters can get past the expense of short-term policies to effect change. SEJ Board of Directors member Jeff Burnside led the recent forum. According to Burnside, in 2019 the media industry will evolve to the point that all journalists will move into energy and environment-related reporting as the issues are poised to sweep newsrooms across the country in one form or another, according to a group of national energy journalists. The event featured Emily Holden from The Guardian asking and Bill Wehrum, U.S. Environmental Protection Agency’s Assistant Administrator for the Office of Air and Radiation a series of questions in a mini-interview, covering a range of agency-related regulatory topics, from carbon emissions to the replacement of the Clean Power Plan. “We believe it is a real success story,” he added. Wehrum defended his previous work representing oil and gas trades. “Ultimately, the reason why I decided to throw my hat in the ring, and again, I feel privileged that it actually got through the process, is I think it’s important for people who understand the issues, understand the law, who understand the technology and the science to be in jobs like this,” he said. “The first two years, I think, of the Trump administration’s tenure has actually been an incredibly sloppy two years, and that’s sort of objectively speaking,” Lipton said. Lipton said former EPA Administrator Scott Pruitt’s personal issues somewhat limited the effectiveness of the changes under the Trump administration, but new leadership, under Acting Administrator Andrew Wheeler appears headed in a different direction. “Wheeler has already shown that he’s a much more disciplined, rigorous leader, and he’s going about things in a more careful, constructive, agree-or-disagree-with-him way,” he added. Wehrum is also that camp, Lipton added. Lipton said the “environment is not getting worse,” but the pace of improvement had slowed. Ellen Gilmer from E&E News said that litigation on any number of fronts would proceed but would not likely be resolved by the end of the current administration. Expect a long process, she concluded. Joshi said that “Climate change, environmental policy, energy policy touches so many different beats” that former agricultural beats in smaller markets have turned into climate beats thanks to extreme weather events. Gilmer added that the regulatory reform of the first two years that some in the media had characterized as “sloppy” did not appear to be the case with the second round of agency leadership, most notably at EPA and the Department of the Interior. “Most of what the agencies are doing is a little bit more careful, a little bit more thought out – you have people like Bill Wehrum, Andy Wheeler, David Bernhardt who are leading these agencies who are not getting into the kind of ethical issues or distractions that that their predecessors were,” Gilmer said. Other success comes from a shift in mindset at the agencies, to work with companies ahead of time rather than penalize them afterwards. Lipton added that one area seeing continuous improvement were massive declines in SO2 (sulfur dioxide) from electricity generation and NOx (nitrogen oxide), produced by burning fuels for transportation. “SO2 and NOx continue to go down at a really rapid pace in the United States,” Lipton said as coal generation shifts to natural gas and renewables.